Risotto is the ultimate rice dish – but a lot of folks are are intimidated by it. Don’t fear the risotto! It isn’t so hard! It’s actually a very flexible dish with lots of room for variation. A couple of batches and you’ll have it down! Great risotto starts with imported Italian Riso (rice), arborio or carnaroli are readily available in our markets, and delicious! 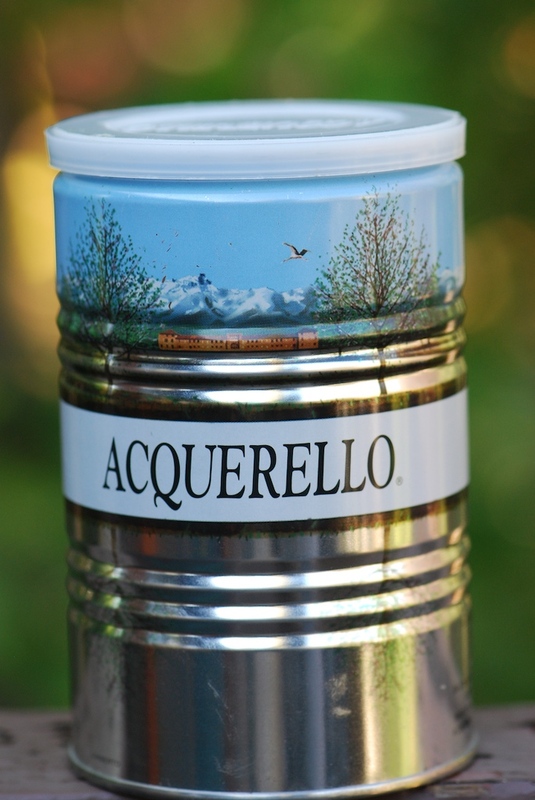 Many gourmands consider the Acquerello brand (pictured right) the finest for it’s texture and creaminess.While this particular risotto has a few extra steps, they’re truly worth it – the slightly sweet and complex fall flavor is perfect as a light meal with a salad, as a first course, or as a side dish with chicken or pork – or even sausages, beef, lamb and game meats. See the video and recipe below, or start with Risotto Milanese if you are a first timer, video and recipe follow. 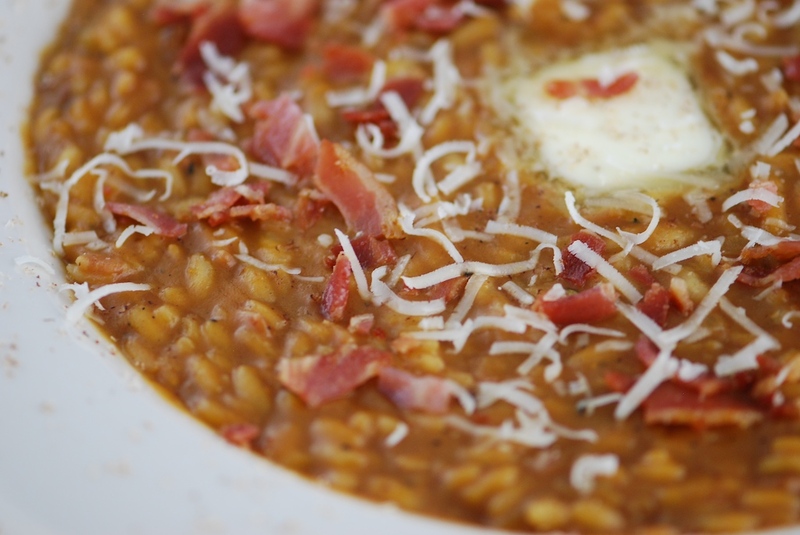 Fall Harvest Pumpkin & Pancetta Risotto – video and recipe found below. A light meal with a salad, or an excellent accompaniment with beef, pork or chicken dishes. Video 2 Risotto Milanese: A classic Milan-style recipe, perfect for the beginner – get the recipe here. With a little practice, you’ll be adding an amazing new dish to your cooking repertoire – and there is no limit to the variations you can create! Search “risotto” in the recipe section of our website for dozens of classic to creative risotto recipes. For serving: butter pats, ground nutmegBring stock to a simmer in a saucepan. In a Dutch oven or heavy 3 qt saucepan, saute onion and half of the pancetta in butter to soften over medium heat. Add Italian riso and saute for about 3 minutes. Splash with wine and stir until almost gone. Begin adding hot stock one ladleful at a time – add stock, stir and simmer until incorporated (2-3 minutes). This will be repeated throughout the recipe until the rice is tender (time depends on rice, temperature and your taste – 20-30 minutes estimated). If you run out of stock, replenish with a little water or more stock. Meanwhile, brown remaining pancetta until crisp, drain and set aside for serving. Half way through cooking, warm pumpkin in microwave and add along with hot stock, brown sugar, cinnamon, ginger, clove and pepper stirring well to incorporate. Continue with stock additions and when stock is almost gone, start tasting – the risotto is done when it’s as tender as you like. Stir in most of the Parmigiano cheese – cover and remove from heat until time to serve. Chef’s Notes: To roast your own pumpkins – split and clean Sugar or Baking Pumpkins, place cut-side down in a roasting pan with 1-2 cups water and roast until tender. Scoop out pumpkin and mash. Variations: feel free to adjust seasonings and sugar to taste. This dish is also quite delicious with additions of cream and butter at the end of cooking. Italian rice prepared in Milan style – with saffron, wine, chicken stock, Parmigiano Reggiano, sweet cream and butter. In a saucepan, heat chicken stock to a light simmer. It will be added in increments to create the risotto. In a heavy saucepan or Dutch oven, over medium high heat, melt 2 TBS butter. Stir in the oil and rice, cooking until you see the pearl. Add saffron threads and wine, cooking until the wine has almost evaporated. Add 1 cup of hot chicken stock to rice and cook at a lively simmer, stirring regularly until the rice has absorbed most of the liquid. Continue to add broth and stir like this until the rice is just tender, or al dente. Turn off flame and stir in parmesan, once incorporated, finish to taste with rich room temperature butter and heavy cream – in Italy they do not skimp on the butter and cream! Adjust seasonings with fine sea salt and fresh ground pepper to taste.